Not too long ago I wrote a post (here) on the candles I had been burning in the run up to Christmas. There is nothing I love more than being cosy, snug and relaxed and candles burning do just that for me. 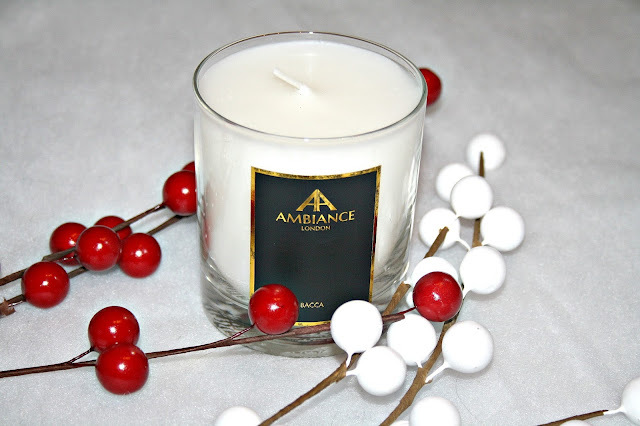 Over the last week there has been another candle that I have fallen in love with and it is the Bacca Berry Luxury Scented Candle from Ancienne Ambiance and honestly, it is just divine. Ancienne Ambiance is a London-based luxury niche brand which was founded back in 2004 and they specialise in creating fine fragrances, home fragrances, body-care, perfumes and natural hand-poured scented candles. Everything you find from Ancienne Ambiance is paraben free, has been created using natural ingredients and has recyclable packaging. Described as being a sophisticated and vibrant fruity blend of redcurrants, blackcurrants and an array of freshly picked bursting berries. A seasonal staple for early hunter-gatherers for thousands of years, Bacca (Latin used for ‘small round fruit’) were also enjoyed by the Romans, Etruscans and Greeks. I absolutely love the scent of this candle, it is one that you can smell as you unwrap it and one which doesn't need to even be alight because it scents the entire room within which it sits. Once alight the fragrance intensifies and because a lot stronger and once it has been burning for a good few hours, the scent intensifies enough to float through the entire house, so if a fruity berry scent with a slight earthy twist is a scent you enjoy, then this candle is one you need. Each candle is hand poured here in the UK, and it’s a slow burning natural wax with a lead free wick and it comes packaged inside a straight glass jar and because it is a huge 200g sized candle, it has a burn time of around 60-65 hours which is really impressive and it costs just £40 here. This sounds lovely. I'd never heard of the brand before but I'll check them out. This sounds beautiful! I acquired so many candles over the festive period and I couldn’t be happier!! Love a good candle hehe! You are absolutely right, there is nothing better than burning a cosy scented candle when you are having an evening in! Great to see such a high-quality British product as well, and a history lover I am intrigued by the Roman and Greek love of this particular fruit too! That is more than I would normally spend on a candle but this is a very impressive burning time so worth the bit extra! Hadn't heard of this brand before but i love berries would be checking it out! I love this brand, and what a cool scent. Bet it makes the house smell divine! Oh these look really interesting! I'm such a candle addict - have you bee to Osmology candle shop yet, it's amazing!